American swimmer Michael Phelps swam his final Olympic race on Saturday, winning his 18th gold and 22nd overall medal with his United States teammates in the the 4x100 medley relay. Fourth-Place Medal pored through the history book to put the total in perspective and come up with 22 facts about Michael Phelps' 22 career Olympic medals. 1. 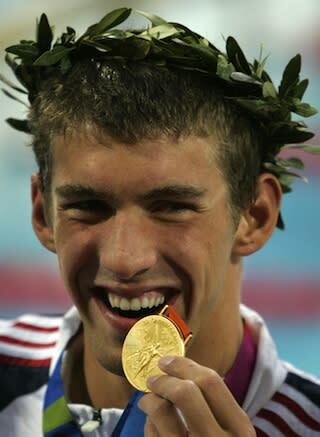 Michael Phelps won his first Olympic medal in 2004. His 18 golds since the Athens Games would rank 12th overall for all nations, ahead of traditional Olympic powers like Romania, Poland, the Netherlands, Cuba and Spain. 2. Speaking of the Spanish, with tennis powers, World Cup champions and Tour de France winners, the nation is generally thought of as a world leader in athletics. Phelps has 10 more golds than Spain since 2004. 3. With his six medals in London, Phelps would rank 13th in the overall medal count, tied with Netherlands, Ukraine and 2016 host country Brazil. 4. Only eight countries have won as many golds in London as Phelps. 5. There have been 48 men's swimming events contested in the three Olympics since Phelps started winning golds. He's medaled in 22. That's 46 percent! Keep in mind he's only competed in 24. 6. We mentioned earlier this week (and others followed a few days later) that Phelps (population: 1) has as many medals as India (population: 1.24 billion). But that's low-hanging fruit. India isn't a country associated with athletics that don't involve wooden sticks. Argentina has produced famous soccer players (Maradona), Grand Slam tennis champions (Gabriela Sabatini, Juan Martin Del Potro) and NBA stars (Manu Ginobli), and has one less Olympic gold in its 112-year Olympic history. 7. Kidding. The Indian thing is amazing. Per capita, the nation has won a medal for every .000000545455 citizens. Phelps has 22 medals for one. 8. Add the total golds won by Israel, Panama, Peru, Ghana, Philippines, Serbia, Portugal, Pakistan, Zimbabwe, Cameroon, Nigeria and Croatia. They still don't approach Phelps' haul. 9. Phelps has as many gold medals (18) as any other Olympian in history has regular medals (Larisa Latynina, 18). 10. Latynina, Carl Lewis, Mark Spitz and Paavo Nurmi have the second-most gold medals in history. They each have nine, half of Phelps' total. Read that again. He has DOUBLE the number his closest competitors have. 11. Eighty-one percent of Phelps' medals are gold. None of the next 20 Olympians with the highest medal counts have as good a percentage as that, and only Carl Lewis (nine golds in 10 medals) has a better ratio in the top 40. 12. The male swimmers with the next-highest career medal totals have exactly half of Phelps' total. Mark Spitz, Matt Biondi and Ryan Lochte all have 11. 13. Three female swimmers (Jenny Thompson, Dara Torres and Natalie Coughlin -- all American) have 12 overall medals. Their combined gold count is 15, three fewer than Phelps has. 14. More Spain bashing: Phelps has more gold medals in London than Spain has total medals. 15. Something Phelps isn't No. 1 in: Latynina has more gold medals in individual events than Phelps. He's won nine of his 22 in relay events. Latynina had 14 overall individual medals and four in team events. 16. He leads golds in the category of individual events: Phelps has 11, three ahead of early 20th-century track athlete Ray Ewry. 17. Phelps won six gold medals in Athens, eight golds in Beijing, and four in London. Those totals rank third, first and 12th, respectively, on the list of most golds in an individual Games. 18. If the list is for most overall medals won at a single Olympics, the 27-year-old ranks first (2008), second (2004) and ninth (2012). 19. No swimmer had ever won a gold medal in the same event in three consecutive Olympics. Phelps did it twice in London, going back-to-back-to-back in the 200 IM and 100 fly. 20. 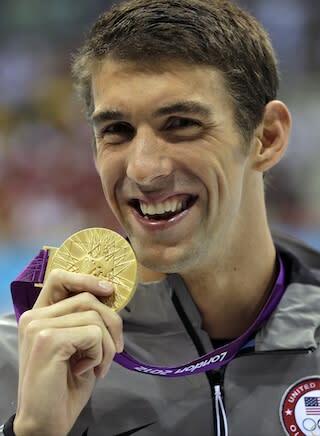 Phelps medaled 22 for 24 in Olympic finals. The only two events in which he failed to medal: the 200 fly in 2000 and the 400 IM last Sunday night in London. Overall, he swam 24 events, 51 races and 9,900 meters overall in Olympic competition. 21. He set eight world records in Olympic competition and 39 overall in his career. Mark Spitz had the previous mark for most world records set (33). 22. The previous 21 facts lead to an incontrovertible final one: Michael Phelps is the greatest Olympian who has ever lived.